Home › Trailing Suction Hopper Dredger › Trailing Suction Hopper Dredger › Trailing Suction Hopper Dredger 650 › TSHD 650 "Tommy Norton"
The Tommy Norton, a Damen Trailing Suction Hopper Dredger (TSHD) 650 built at Damen Shipyards Yichang has been officially delivered to her proud owner, Gippsland Ports. 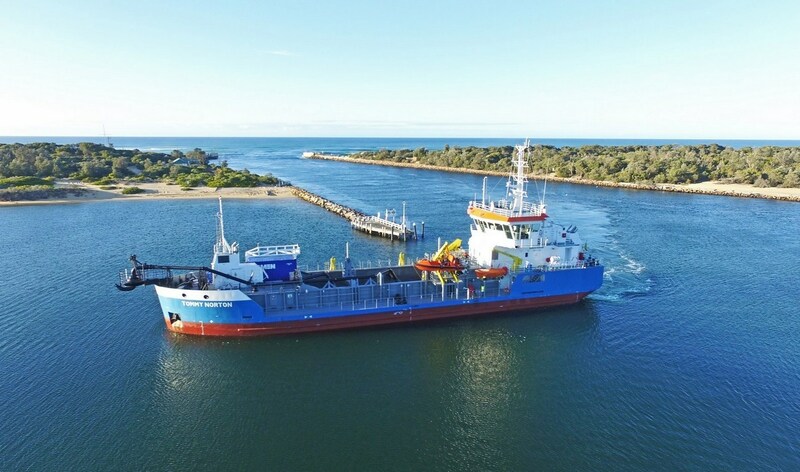 The first dredger to be built by Damen Shipyards Group for Australia, the 60-metre Tommy Norton has now started work to deliver safe and reliable ocean access for the commercial vessels, oil & gas suppliers and commercial fishing fleet that cross the entrance bar to the Gippsland Lakes area. The maintenance dredging also helps reduce the risk of flooding to local communities. Capable of dredging to depths of 15 metres, the dredger has been built with bottom doors to enable self-emptying and can alternate between a bow connection and rainbow expulsion for beach reclamation work. In order to increase the vessel’s payload capacity when dredging sand with a high specific density, Damen has reduced the freeboard of the vessel and applied a dredge mark.